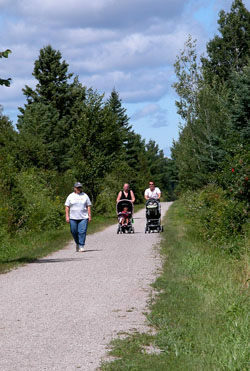 The northern half of the North Central State Trail stretches 33.8 miles from Indian River to Mackinaw City, passing through Cheboygan within 16 miles. All three towns have well developed trailheads with restrooms and parking while nearby are restaurants and other businesses. Indian River marks the halfway point of the rail-trail and, in the minds of many, the start of its most scenic section. 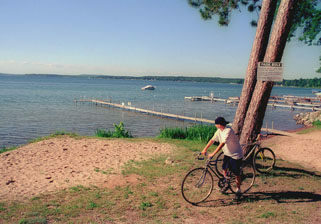 A ride from here along the west shore of Mullett Lake to the hamlet of Mullett Village would be a round-trip of 24 miles with the vast majority of it within view of the lake. To shorten that ride even further, begin at picturesque Topinabee, an ideal staging area at Mile 33.7 of the rail-trail. From here a round-trip ride along the lake would be an easy ride of 13.2 miles. From the trailhead at the Indian River Chamber of Commerce Visitor Center, you cross the Indian River on a former railroad bridge and depart the town. At Mile 29.4, the trail passes underneath I-75 and arrives at the “spreads” where the Indian River, surrounded by beautiful wetlands, enters Mullett Lake. Soon you’re following the shore of Mullett Lake and at Mile 33.7 arrive in Topinabee. At the heart of this quaint village is its former Michigan Central depot. Built in 1881, the depot is now a library and museum where inside you can read how the town's namesake, Chief Topinabee, is responsible for Chicago and why the railroad was built on the west of the lake instead of the east. Surrounding the depot is Mullett Township Park where you’ll find bike racks, restrooms, picnic tables, a beautiful view of Mullett Lake and a swimming beach for those hot summer afternoons. Also within a short walking distance are restaurants and a market. The North Central stays with its lakeshore route for almost 7 miles, closely following the shoreline of Mullett Lake, the fifth largest inland lake in the state at 16,630 acres. You're not only riding along the shore of the lake but gazing north at the length of it and enjoying the breezes off the water. On the opposite side is M-27 but a line of trees and thick brush form a natural barrier between you and the state highway, making the traffic not nearly as obtrusive. The only railroad trestle along the lakeshore stretch is reached at Mile 38.2 and crosses Mullett Creek. This another scenic stretch; you break out of the trees, bump across the old trestle and then continue right along the shoreline for almost a mile, so close to the water you're looking down at small cottages, docks and sandy beaches. At Mile 40.3 you reach the hamlet of Mullett Village where there is a swimming beach and picnic tables at Inverness Township Park. Less than a quarter mile off the trail is a market at North Straits Highway and Polish Line Road. North of Lake Grove Road, the trail swings away from the Mullett Lake and heads due north for Cheboygan in a stretch where forest gives way to pleasant farm scenery near the city. The city’s new trailhead facility is reached at Mile 45.6 at the junction of Western Avenue and Taylor Street, southwest of the downtown area. The trailhead includes restrooms, picnic area and a large parking area and is also a staging area for the rail-trail. After passing through Cheboygan the North Central swings northwest and skirts US-23 for the final leg, a 16.3-mile ride to Mackinaw City. Even though at times you’re less than 250 yards from Lake Huron, you rarely see it or US-23 for that matter. A thin but effective barrier of trees and brush keep away the views of surf and motorists. At Mile 58, you pass through the entrance area of Historic Mill Creek, one of the Mackinac State Historic Parks. 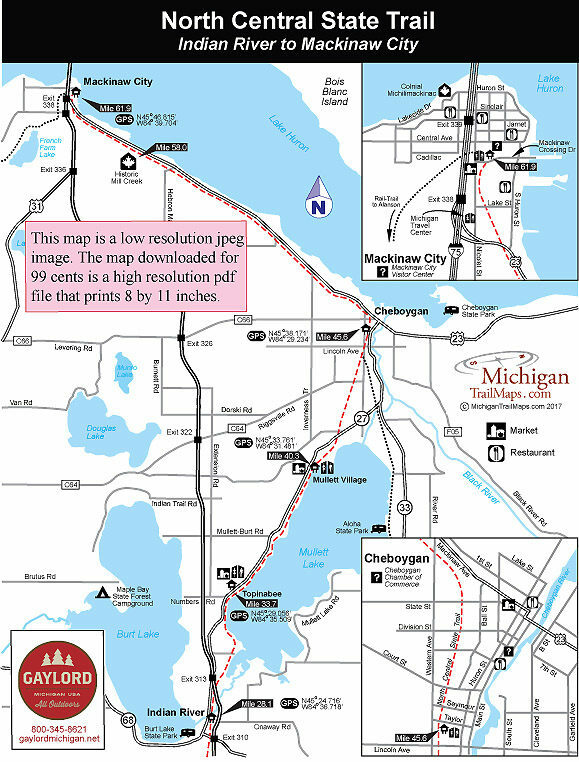 Eventually, the North Central crosses US-23 and enters Mackinaw City at Mile 61.9. You end up at the northern trailhead, located on the backside of the Mackinaw Crossing shopping and entertainment area off Mackinaw Crossing Drive. Within a block or two in almost any direction are restaurants, stores, ice cream parlors and fudge shops. The trailhead serves as a major junction of trails. It represents the northernmost point of the North Country Trail in Lower Peninsula as well as the northern terminus of the Midland-to-Mackinac Trail. Also departing from here is the Petoskey-to-Mackinaw City Rail-Trail. There are no vehicle or entry fees for using the North Central State Trail. The major trailheads are in Gaylord off of Fairview Ave., Indian River on Straits Hwy., Topinabee off M-27, Cheboygan off of Western Ave. and in Mackinaw City off of Mackinaw Crossing Dr. GPS coordinates for each are listed on the trail maps. Contact the Gaylord Convention and Visitors Bureau (800-345-8621; www.gaylordmichigan.net) or the Top of Michigan Trails Council (231-348-8280; www.trailscouncil.org). For additional information on lodging, bicycle rentals and restarants you can also contact the Indian River Chamber of Commerce (231-238-9325; www.irchamber.com), Cheboygan Area Chamber of Commerce (231-627-7183, 800-963-3302; www.cheboygan.com) or the Mackinaw City Chamber of Commerce (231-436-5574, 888-455-8100; www.mackinawchamber.com). All the above chambers and tourism bureaus maintain visitor centers that are shown on the trail maps.